Hollywood actor and TAG Heuer brand ambassador Chris Hemsworth will serve as honorary starter for the 102nd Running of the Indianapolis 500, waving the green flag on Sunday, May 27 at the Indianapolis Motor Speedway. TAG Heuer is the “Official Timepiece of the Indy 500” and “Official Timepiece of the Verizon IndyCar Series.” In March 2018, just in time for the start of the season in St. Petersburg, Florida, TAG Heuer announced the extension of its partnership with IMS and the series. To celebrate its partnership with IMS and the Verizon IndyCar Series, TAG Heuer has released two limited-edition Indy timepieces, a Carrera Heuer 01 and a Formula One. Both watches are designed to honor the 102nd Running of the race and TAG Heuer’s history as a luxury sport brand, melding automotive technology with Swiss watchmaking mastery of creating high-performance watches. Each piece of the 500 Formula 1 Indy 500 Limited Edition and the 102nd piece Carrera Calibre Heuer 01 Indy 500 Limited Edition features the Indy 500 logo and notes the limited-edition number engraved on the case back. 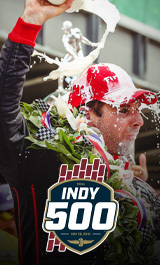 Visit IMS.com to purchase tickets for the 102nd Indianapolis 500 presented by PennGrade Motor Oil and for more information on the complete Month of May schedule at IMS.